A relative newcomer, lager became common in the 19th century. Now it\'s the most popular beer around. Our take on this favourite is a refreshing, straw-coloured lager with a subtle aroma. This light, easy-drinking beer is ideal with hot dogs, pizza, hamburgers, steak and salads. Gather your friends around the barbeque on a hot summer afternoon and enjoy this refreshing premium beer. India Pale Ale was developed in England during their colonization of India. The civilians and soldiers living there had no access to beer of their own, as tempertaures on the sub continent were constantly too warm for brewing. Attempts at shipping beer from England( usually the new \'Pale\' ales that were becoming so popular) were foiled by the rocking of the waves and the high temperatures in the ships hulls, which spoiled the beer long before it reached its destination. Back in London, a brewer named George Hodgson began brewing beer for export to India. The beer was brewed with a higher alcohol level, and higher hopping rates to preserve the beer on its journey. The beer was a success in India, and \"IPA\" as it came to be known, caught on in England as well and a new beer style was born! Our India Pale Ale has a copper/golden colour with a slightly higher starting gravity and hop rates than our regular Pale Ale with medium aroma hops. 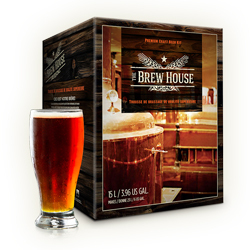 The Brew House IPA is a perfect match for spicy foods and BBQ, as it has the fortitude to stand up to the \'big food\' flavour, yet is still crisp and refreshing on the palate. Crisp and refreshing. The finish is dry and the hop profile has the same distinct aroma as that famous clear bottled Mexican brew. The Brew House Cerveza is great with burritos, enchiladas, tacos or just relaxing in the sunshine. Since the mid-19th century this dark beer has been brewed in the Bavarian city of Munich. Our version is characterized by a delicate sweet maltiness and a toasted nutty flavour. This rich, medium bodied beer will compliment chicken or pasta dishes. You\'ve been hitting the ski-slopes all aftenoon. Now relax in front of the fireplace and savour the dark, toasted warmth of this unique beer. A beer with roots in the English Midlands, pale ale dates back as far as 1870. Today it is copied worldwide It is a perfect beer with red meats and cheeses. The original pilsner was brewed in the Czech Republic in 1842. Now, as then it is known for its generous use of hops. Our medium-bodied, golden pilsner is a clean, satisfying beer. This elegant beer is delicious all on its own. It is also a perfect companion for seafood. You\'ve long enjoyed lagers and pale ales. Now your tastebuds are ready for this truly international beer. Stylistically positioned between a German Alt Beer and the Oktoberfest, our red ale is copper red in colour. It has a pronounced crisp, malty character, with delicate hop bitterness and a pleasing floral aroma. Blessed with all of these thirst quenching attributes, this beer is sure to please! Best enjoyed with friends, barbecued ribs, jalapeno poppers and dry garlic jumbo prawns. Brewed since at least 1820, stout is Ireland\'s gift to beer lovers. Ours is dark and rich with rich chocolatey-espresso finish. Stout is a perfect match for shellfish, particularly oysters. Also great wth curries and strong cheeses.